By Arctic Cat standards the Crossfire 5 is a ‘throw back’ to pre-F Series models. It is a reflection of the evolution of the Firecat series, which effectively ceased when the new look Jaguar came into the line. That liquid-cooled, multi-featured, rider-forward model began the move away from feet stretched out, high handlebar/low seating position Arctic Cats that had gained a near fanatical following. 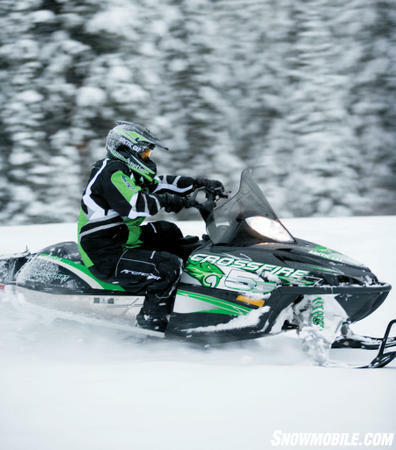 Those diehard fans may not have forgiven Arctic Cat yet, even though the Minnesota-based snowmobile pioneer caved in to their pressure and for 2009 gave them the short-tracked Crossfire R, essentially a recreation of the Firecat. The 85 horsepower Crossfire 5 retains some Firecat heritage while it seems to fill a niche as the ‘starter’ sled for boondockers in training. Serious boondockers will go for more power. It’s available. There are four stretch track Crossfire models. 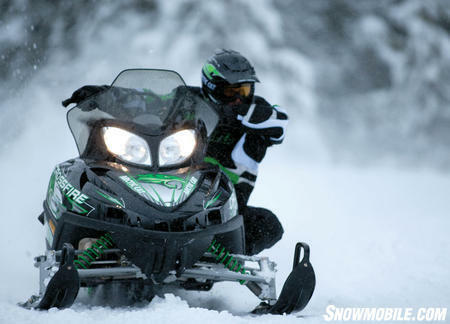 The most powerful comes with Arctic Cat’s Suzuki-built 1000cc twin. Between the one-liter model and the modestly powered 500 twin are a 794cc twin and the popular 599cc twin, which retails for US$1,400 more than the base Crossfire 5. Arctic Cat outfitted the Crossfire 5 with longer travel, but reworked older design front and rear suspensions. Since Arctic Cat does not offer a 500 twin in its mountain M-Series model mix, the Crossfire 5 with its 141-inch track effectively serves as an introductory model for powder beginners. Still, we see the Crossfire 5 as a bit of an orphan. It’s not going to be first choice for boondocking and it’s not really a sports performance model either since the rider-forward F5 fills that niche well. In reality, the Crossfire 5 may be miscast in the Arctic Cat line. But it does offer diversity that the F5 cannot. As a trail sled, its extra length suspension bridges those annoying stutter bumps well. 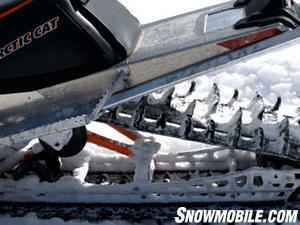 The added flotation of the 15-inch wide by 141-inch long Camoplast Cobra makes it a good fresh snow player. Its 499cc engine may be modest at top end, but it does have suitable low end grunt to help beginning boondockers lumber along as they pick a path through off-trail wooded sections. The two-stroke engine features very good characteristics for boondocking. As noted, it has very good bottom end and smooth transition to midrange. The batteryless electronic fuel injection is spot on as an easy pull on the throttle flipper gets the dual 38mm throttle bodies responding quickly. Since the 500 is one of Arctic Cat’s tenured twins, it has earned a reputation for being extremely reliable and durable. Evolutionary mapping changes in the electronic control module means the diminutive twin will provide reliable performance, something you really want to have when breaking your own trail. Top speed may be modest, but bottom end for pulling out of corners is good. Arctic Cat engineering completes the Crossfire 5 powertrain with the proven planetary gear set of the ACT Diamond Drive. The pairing of the smooth twin with the smooth drive allows beginners the luxury of making a few mistakes. Since the ACT drive is engineered for lower engagement speeds, beginning riders will find power delivery to be smooth, helping them to avoid ‘trenching’ in fresh snow. It should help new to powder riders learn how to work through various snow conditions without getting totally buried. Which isn’t to say, they won’t get buried. The 2009 Crossfire draws on M-series engineering for its tunnel design. Fortunately, the Crossfire 5 shares the same platform as the more powerful Crossfire versions. The new aluminum tunnel offers improved flotation thanks to its lightweight construction. The runningboards allow ample room for the rider to move about, shifting weight, moving the feet from front to back. If this sounds a bit like the features found on the M-series of deep powder sleds, well, that’s because the Crossfire line shares features with Arctic Cat’s mountain sleds. The tunnel not only features flatter runningboards, but you’ll find it is better at snow-evacuation than previous versions. Even the handlebars provide greater control as they have been brought in an inch — actually each hooked end was moved inward by a half-inch. The Crossfire 5, like its siblings, comes with thousands of miles of engineering experience built into it. There are a myriad of little things that set the Crossfire apart. The rear of the hood facing the rider’s knees is actually curved inward, adding more legroom and comfort. The windshield is not simply a styling statement; it actually redirects cold and snow. The handlebar riser easily fits for standing while working around obstacles, like downed snow-covered tree limbs. The Crossfire 5 sits low with tall bars. Arctic Cat engineering deliberately chose a slightly longer track. The 141-inch size replaces the more familiar 136-inch track, which was used in the past. The extra five inches of track gets ample traction to the snow thanks to the 1.25-inch lug height and the action of the reworked skidframe which shares the same 3.0 pitch with the M-series of mountain sleds. The FasTrack long travel rear suspension combines hydraulic tube shocks with torsion springs to control up to 17-inches of travel. Arctic Cat’s famed AWS wishbone front suspension offers up to 9.2-inches of travel. Hydraulic shocks come standard, but you could easily upgrade to high-pressure gas shocks later. Stance can be adjusted from 42 to 44-inches center-to-center of the plastic saddleless skis. The Crossfire 5 comes with a digital/analog speedometer/tachometer and dual stage trip meter. Reverse is standard, but you’ll pay extra for electric start, which you really won’t need since the 500 twin pulls over easily. 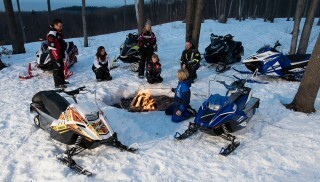 Arctic Cat offers a full complement of accessories to suit your sledding lifestyle. While we accept that the more serious off-trail rider will opt for more power, the Crossfire 5 is well-suited to giving new riders an easy-riding, smooth-running snowmobile to help them ease into riding powder or breaking their own trail. Elliot Lake is My Kinda Snowmobiling Town!